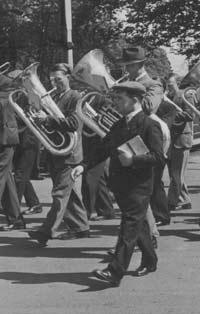 Mr Stead - or Charlie as everyone knew him - had been a member of the band well before 1950. He had already taken on the role of secretary when more formal records began to be kept by him in 1949. He continued in this role until 1977 - a period of around 30 years. Since then, he had been an active member of the bands committee and until recently had marched with them playing his side drum, as when supporting the Scouts in their annual St Georges Day parades. Charlie had many other interests centred in and around Driffield and in his younger days was well known moving around the town on his cycle as he pursued these occupations. It was with this in mind that the band committee set about formulating a plan which would both acknowledge his interests and make full use of the bequest. The cheque has been invested and will grow; it will be added to from time to time as a result of appropriate concert receipts/income. Band spokesman Mike Clark said: "We are proposing to put before the bands AGM in the New Year a resolution which would support one of our members who would be planning to become involved in some kind of educational, yet music related project. This might be a short course, travelling as part of a wider venture, purchase of materials etc. "A formal application would be made to the bands committee who would consider the proposal on its merit in the light of the funding available. "It gives great heart to those of us who support the work of Driffield Silver Band that so many people over the years have thought highly of the bands educational and musical aspirations that they should wish our endeavours to prosper, and so commit their resources to our future. "We are indeed grateful to Charlie, his family and indeed all our supporters."